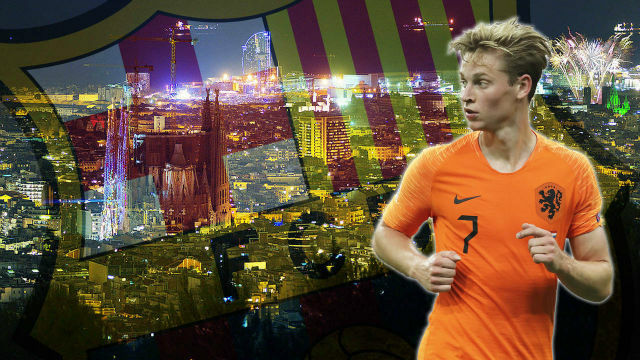 In contrast to what happens at other times, Frenkie De Jong has generated a unanimous agreement among Barcelona’s board and staff. It’s hard for everyone to agree in football, but the play and daring of the Dutch midfielder has seduced Pep Segura, Eric Abidal, Ramon Planes, Ernesto Valverde and the rest of the scouts that work for Barcelona. They agree the Ajax midfielder should be Barcelona’s grand priority. However it will be a long-term operation. This summer they made an offer which Ajax snubbed as it was too low. “Barcelona didn’t value the player sufficiently,”r; said Marc Overmars, the sporting director at Ajax who will be key to a deal. Barcelona think next summer is the ideal moment to sign the 21-year-old. The winter window is basically discarded because as Overmars says, he won’t let players leave then, with Ajax back in the Champions League and determined to impress after four years out of it. It will not be an easy operation because De Jong has already alerted many other sides in Europe. Above the 30 million Barcelona offered, Tottenham offered 50, although Ajax want around 75m for the player who has a contract until 2022. Even Real Madrid have been linked. “Barca can allow other errors but not letting De Jong escape,”r; said Robert Fernandez, the former Barca sporting director. In his final days in charge he privately confessed that De Jong is a player who meets everything that Barca want and need. Possession, touch, vision of play, i.e. he understands the Barcelona style. For his youth, potential and talent he is an ideal signing. Right now he is exploding onto the scene, making an excellent debut for Holland under another Barca ex, Ronaldo Koeman. “He’s a debutant who plays like a veteran, with a lot of quality, he’s a great talent,”r; said the coach.